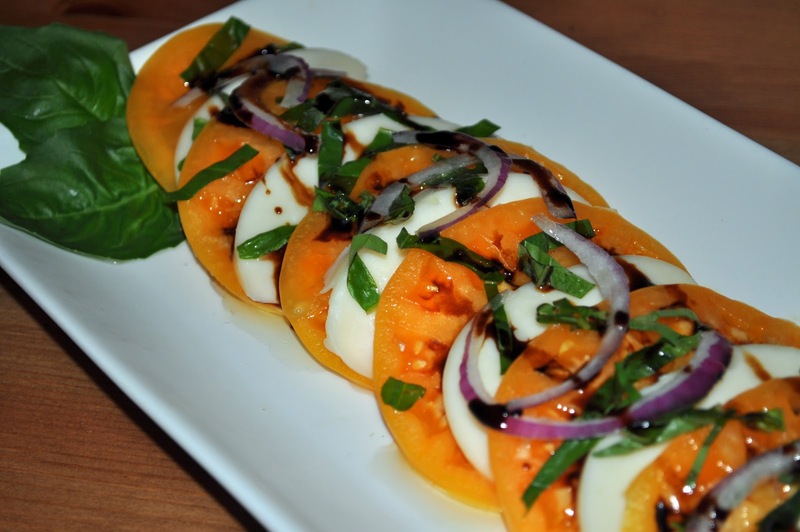 I recently tried a Caprese salad with a balsamic reduction and wanted to try making it myself, I only wish I would have known sooner how easy a balsamic reduction is to make, because it really added an amazing flavor to one of my favorite salads. On Saturday the boys and I headed out to our local farmers market; we found some really yummy produce including some delicious orange heirloom tomatoes, so I thought today would be the perfect day to make a Caprese salad with a balsamic reduction and of course share the recipe with you! Slice each tomato into 8 slices of equal width. Slice the mozzarella into 16 slices of equal width. To assemble the salad, place one tomato slice on the top part of the plate and season lightly with salt. Lay one slice of mozzarella; continue until all the slices are layered one on top of the other, lightly salting each layer. Drizzle 2 tablespoon of olive oil on top of the tomato and around the plate. Drizzle 2-3 teaspoon of Balsamic Reduction around the tomato and mozzarella. To finish, garnish with chopped basil, I also like adding red onion slices. Serve chilled. In a non-reactive pan, bring the vinegar to a boil until it has reduced to 1/4 cup. Reduce the heat to low and cook until it is the consistency of syrup, about 2 to 3 minutes. Watch the sauce carefully; it can burn if it is reduced too much. The sauce can be stored, covered, in the refrigerator for up to 5 days. this is my favorite salad & I NEVER knew that was all you had to do to reduce the darn vinegar so thank you!! Mitzi, I thought it was going to be hard too and when I looked up how to make it I really thought "is that it" LOL. Enjoy! yumm, yumm, this looks soo good I want to eat the whole thing.. That is an easy recipe.. hopefuly I don't mess it up.. lol! I am going to try it.. Thanks Adri!